Description: The Vintage Curtain features both V-shapes and Diamonds made with Square Knots. 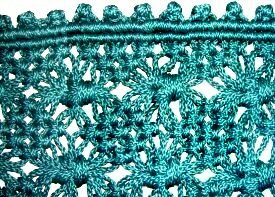 In addition, you will be tying thick Square Knots made with multiple cords. The buttons along the top are custom designed so the curtain rod passes through loops behind them, which hides the rod somewhat. 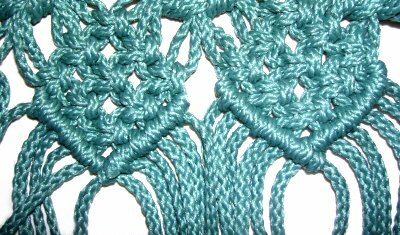 This Macrame pattern is rated medium, but is suitable for beginners who have experience tying the knots. Cut the appropriate number of cords to the lengths you came up with. You also need to cut two holding cords, which should be the finished width of the Vintage Curtain plus 6 inches. Multiply the number of cords by the length. Add to that number the length of the two holding cords. To convert the amount into yards or meters, divide the final number by 36. 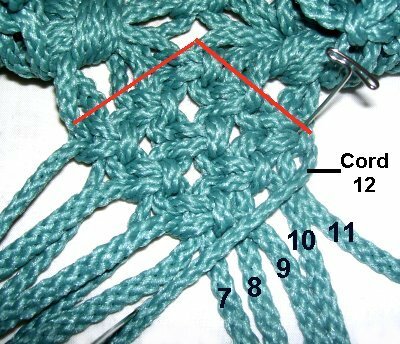 Step 1: To make the special loops for the top of the Vintage Curtain, follow the instructions below. These are optional, if you prefer to attach the cords directly onto the rod. Each loop and button requires 2 cords. Important: Create all of the button/loop designs before moving on to step 3. Fold one cord in half and secure it to the board so that one half is on top and the other. 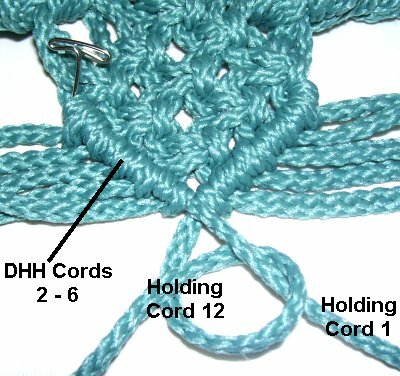 Place a second cord under the first and center it, matching the ends. This is the working cord. 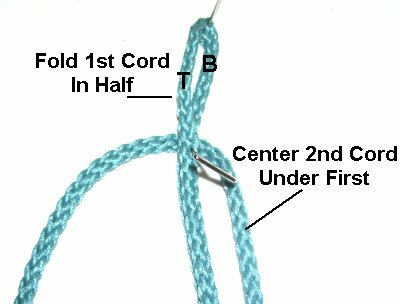 Tie the first half of a Square Knot using the working cord (2). 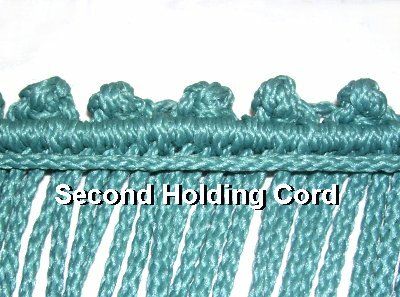 The two halves of cord 1 are the fillers. You should now have a loop, in which the opening is sideways. The curtain rod will fit through it horizontally. Important: Adjust the size of the loop by pulling on the ends of cord 1. It should be double the thickness of the rod, plus a little extra. 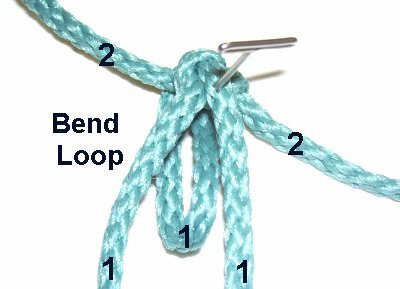 You will be folding the loop in the following steps, which will make it smaller. In the example, a 1/2-inch rod was used, so the loop was 1 inch with an added 1/8-inch. Complete the next two steps. 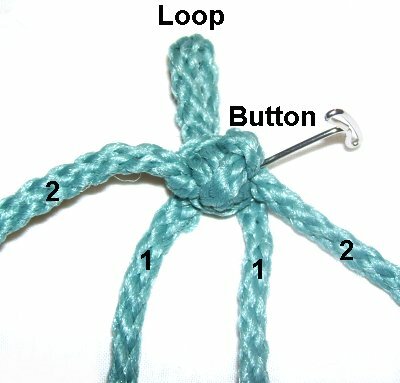 You can remove the knot to make adjustments if necessary. Step 2: Bend the loop backwards and down. Make sure the ends of the working cord (2) are to the sides. 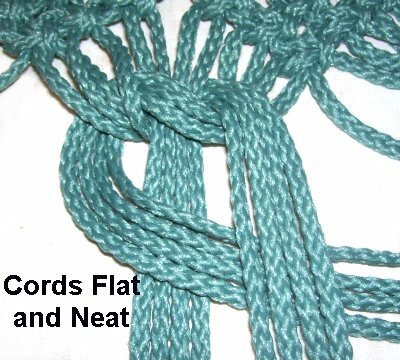 The ends of cord 1 should be vertical. 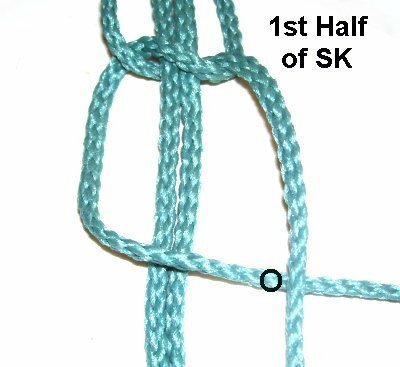 Use working cord 2 to tie the second half of the SK. 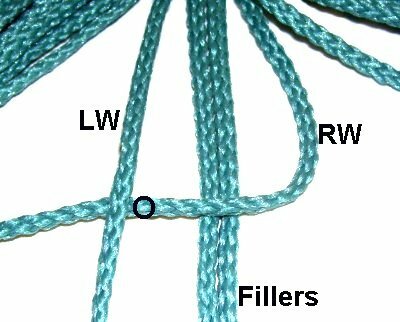 The loop and the ends of cord 1 are the fillers, so make sure you go around both as you tie the knot. Tug on the ends of the working cord (2) until the button is round and neat. The loop should be behind it. Note: In this image, the loop was pulled upward and the button tilted slightly, so you could see it more clearly. Step 3: Once ALL the loops are finished, secure a holding cord on your board horizontally, so it's taut. Place a button/loop design above the holding cord, resting against it as close as possible. 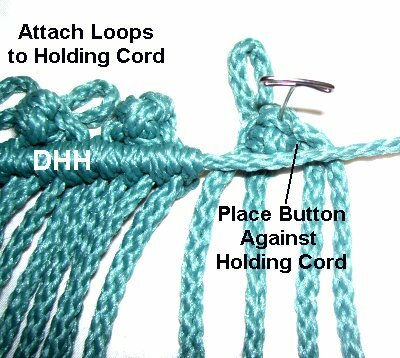 Step 3, continued: Attach the four ends to the holding cord with Double Half Hitches. Tighten both Half Hitches firmly, to eliminate any gaps between the holding cord and the button. Repeat with the remaining loop/button designs. Push them close together as you progress, and measure to make sure the total width is what you need. Step 4: Place the second holding cord on top of the working cords, horizontally. It should rest just below the first row of DHH. Make sure it has tension when you secure it. 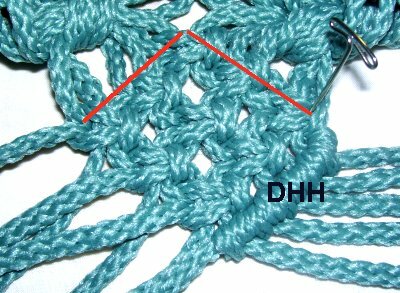 Attach each working cord to the 2nd holding cord with DHH. Tighten them firmly so the two bars are as close as possible. below is a review of the steps. You can tie left SK instead of right, if you wish to change this design. 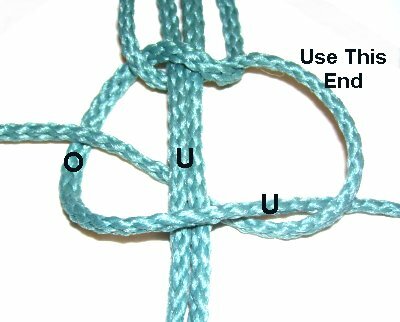 Make sure all the knots, including the large ones, are facing the same direction. Use four cords, so you have two working cords and two fillers. Move the right working cord (RW) towards the left. The left working cord (LW) should rest over it. 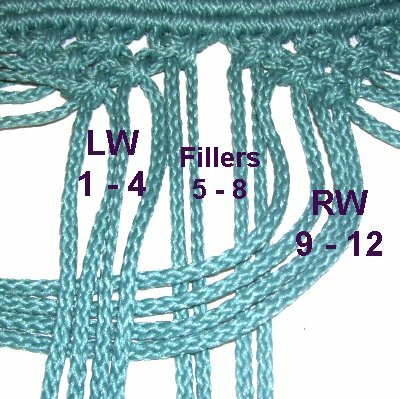 Bring the left working cord under the right one, and then under the fillers. Bring it over the right working cord, as you pull it out on the right side of the knot. Tighten the first half by pulling on both ends. Move the working cord that is now on the left, over to the right. Pass the other working cord over it. Move the right working cord under the left, and then under the fillers. Bring it over the left cord as you pull it out on the left side of the knot. This is what the right facing SK will all look throughout the Vintage Curtain design. Step 5: All the V designs along the top of the Vintage Curtain are to be made with 12 cords. Divide the cords into separate groups. Mentally number the cords 1 - 12. 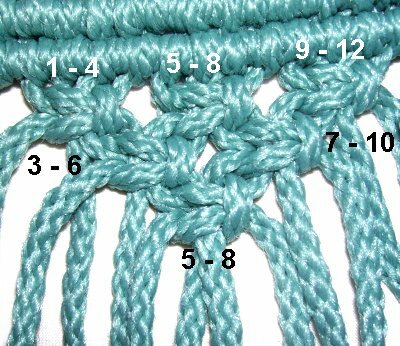 Tie the first row of Alternating Square Knots using 1 - 4, 5 - 8, and 9 - 12. The second row is tied with 3 - 6 and 7- 10. 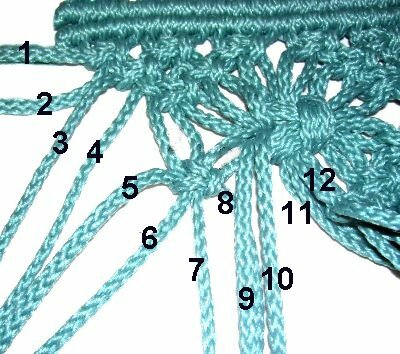 The knot in the third row is tied with cords 5 - 8. Design Tip: The V designs show up better if all the ASK are tightened firmly, and arranged close together. The Large Square Knots rest between the V designs. Follow the steps below to make each one, repeating the process all the way across the Vintage Curtain. Step 6: Start at the left edge, and push the first 6 cords aside. These are coming off the left edge of the first V design, on the left side of the curtain. Note that at the bottom point of the V shape two cords will be pushed aside, and the other two will be used in the following steps. Locate the 12 cords you need for the large SK. Six cords come off the right edge of the first V shape on the left. The remaining 6 cords come from the left edge of the V design to the right. Mentally number the cords 1 - 12. The left working cords are 1 - 4. The fillers are 5 - 8, and the right working cords are 9 - 12. 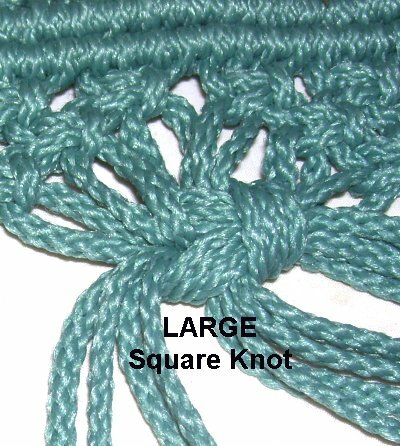 These cords work together to make the large right Square Knots. Try to keep them as organized as possible. Important: The cords should rest side-by-side in the area above and below the knot. 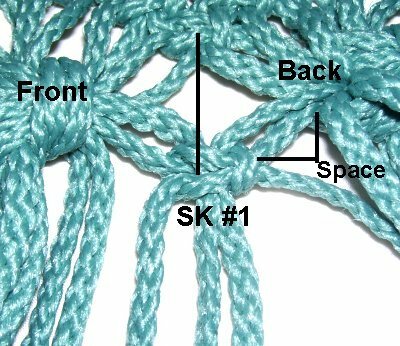 They will overlap within the knot, but keep them as neat as possible. 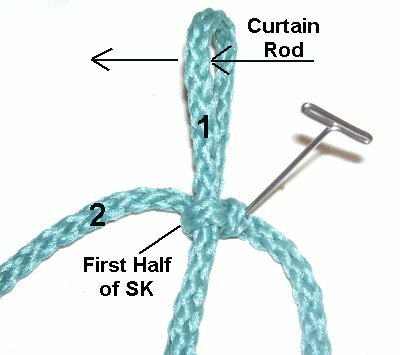 This is the most challenging area of the Vintage Curtain, so take your time making these knots. 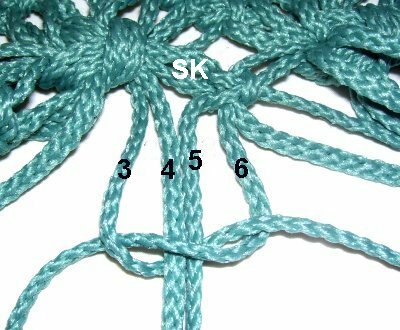 Tie the first half of the large SK. Tighten it so it rests just below the lower points of the two V designs. 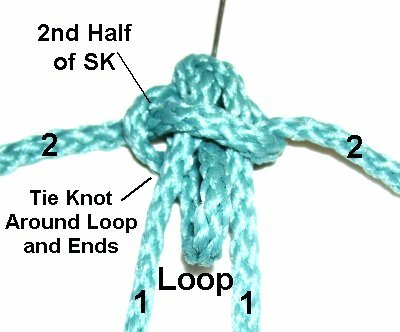 Tie the second half of the large SK. In this image, notice how the cords start off neatly arranged so they don't overlap. Tighten the second half firmly, so the large SK is as tight as possible. Tie the large SK with the remaining cords, all the way across the Vintage Curtain. 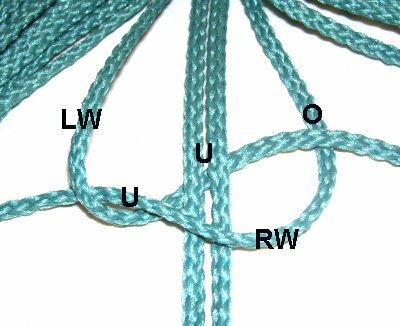 Make sure all the knots are between two V designs. 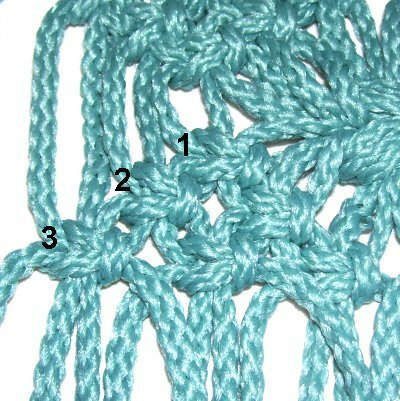 The first and last 6 cords at the edges are not used for these large knots. The Diamonds for the Vintage Curtain are made with both increasing and decreasing rows of ASK. In the first three rows you will use more cords (increase) as you progress. The final two rows are decreasing, since you will drop cords. Step 7: Organize the cords in groups of 12, starting at the left edge. Mentally number each set 1 - 12. Note: The diamond shapes at both edges will be slightly different than the others. Some of the cords come straight down from the V designs near the top of the Vintage Curtain. 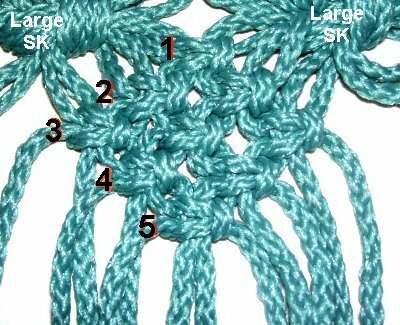 The others come from the large Square Knots. Row 1: Use cords 5 - 8 to tie one SK. Leave some space so it matches the area just above it. 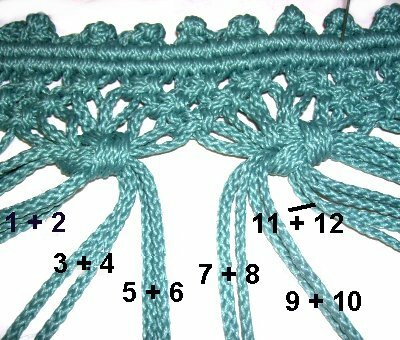 Row 2: Tie one ASK using cords 3 - 6 and another one with cords 7 - 10. Row 3: Use cords 1 - 4, 5 - 8 and 9 - 12. Row 4: Use cords 3 - 6 and 7 - 10 (not shown). Step 8: Select the next 12 cords to make another diamond shape. These will come from two large SK. Organize them before tying the knots. Six cords will come from the right side of the SK on the left. The next six should come from the left side of the SK on the right. 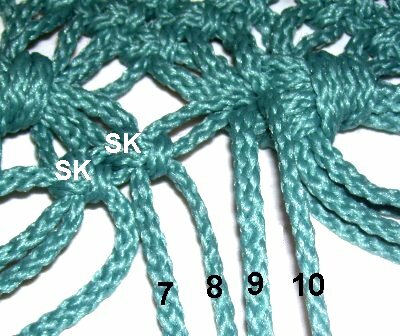 Row 1: Tie a right SK with cords 5 - 8. 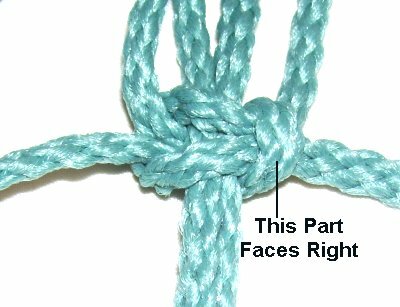 This first knot should line up with the point of the V shape above. There should be a small amount of space between this knot and the two large ones. Row 2: Use cords 3 - 6 to tie the first ASK. Use cords 7 - 10 to tie the next ASK in the second row. 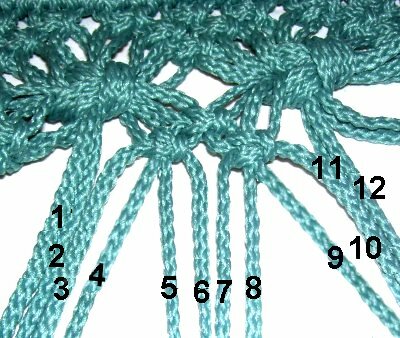 Row 3: Use cords 1 - 4, 5 - 8, and 9 - 12 to tie the ASK. Row 4: Use cords 3 - 6 and 7 - 10 to tie the ASK. Row 5: Use cords 5 - 8. Step 9: Repeat Step 8, all the way across the Vintage Curtain design. When you get to the right edge, repeat step 7. Mentally number the cords from right to left, so you can use the same instructions. Step 10: Repeat Steps 5 - 9 to make the curtain longer (top to bottom). Stop when it's the desired length. Important: Make sure you stop on step 9, so you finish the curtain with the diamond shapes. Step 11: Organize the 12 cords coming off the bottom of one diamond shape. Move Cord 12 (on the right), down along the right lower edge of the diamond (diagonal). This is a holding cord, so make sure it's taut. Step 12: Attach cords 11 - 7 to it with clockwise Double Half Hitches (in that order). Step 13: Move cord 1 along the left lower edge of the diamond. Attach cords 2 - 6 to it with DHH, rotating counter-clockwise. Attach holding cord 12 to it with DHH, to make the point at the bottom. Step 14: Repeat steps 11 - 13 all the way across, to finish the lower edge of each diamond. 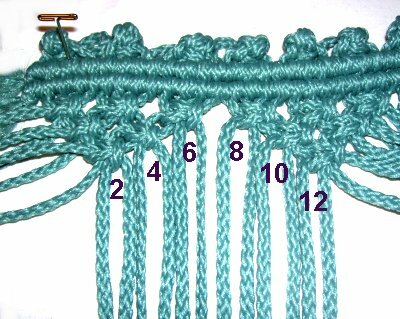 Step 15: Trim the ends and unravel each one completely to form a wavy fringe. 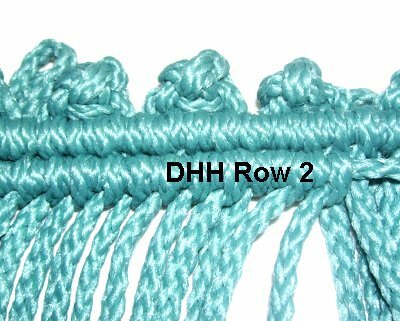 To make a beaded fringe, trim the ends, apply small beads, and tie a Barrel Knot just below. Apply glue before tightening. Once the glue is dry, you can cut off the extra material. Slide the rod through the loops at the top of the Vintage Curtain, and then attach the rod to your window frame. Have any comments about the Vintage Curtain? Contact Me.